iHerb Haul #12 – One phenomenal Korean skincare product & more! 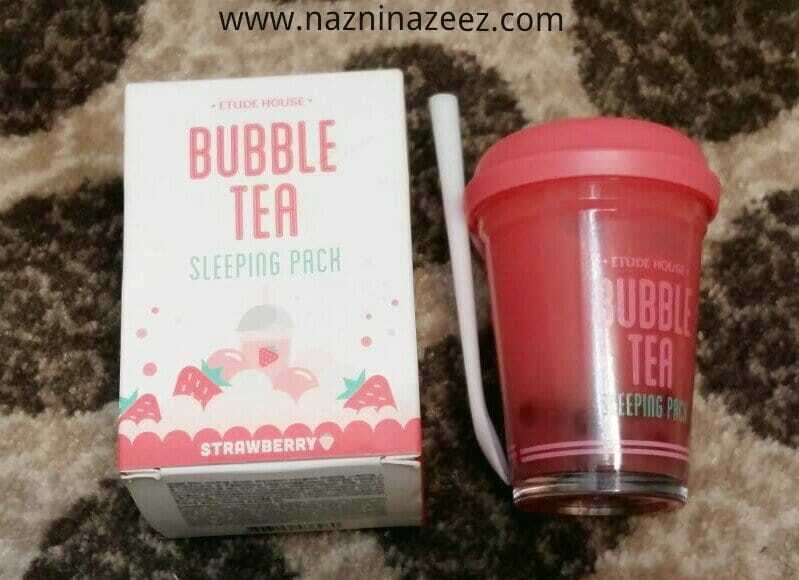 ● Etude House Bubble Tea Sleeping Pack – Etude House is one of the most popular Korean brands. Koreans are knows for their elaborate skincare routines and beautiful skin. Sleeping pack is a new concept to me. So, I decided to give it a try. Basically, it’s a face pack that works while you are sleeping. It’s used in place of the night cream, like twice a week. Before going further with the review, I gotta talk about the packaging!. Koreans make the most adorable & cute stuff. This product is made to look like a bubble tea, complete with tapioca pearls lookalike in it!. It definitely looks edible. It comes in a glass, with a plastic lid and a scoop. Inside, there is another protective lid to avoid the product from transfering. I chose the ‘Strawberry’ one. It’s pink in color and has a unique kind of water like, ultra lightweight texture. It smells amazing. On application, it’s like a splash of water, quenching the thirst of dry skin. It’s super hydrating. When you have extra dry feeling, get hold of one of those pearls with the scoop that it comes with, break it apart, mix with the strawberry pack and apply. On waking up the next morning, the skin feels extremely hydrated, well rested, soft and supple. Definitely try this out. It’s a boon for those with normal/dry skin. Another variant of this sleeping pack is the ‘Green tea’ one. Price : $13.84 (Approx AED 50.82) for 100 gms. But I paid only $11.76 (Approx AED 43.72) since Etude House was one of the Brands of the week (which features brands at 10 – 20% off), at that time. In 2017, iHerb has revised several of their product prices. So, currently this one is priced at $12.33 (Approx AED 45.29). ● Desert Essence Daily Essential Moisturizer– I have so many day and night creams, but nothing that’s general in nature. That’s why I decided to buy a daily moisturizer. This one contains Jojoba oil & Aloe Vera, along with many other plant based ingredients. It is crueltyfree, vegan, fragrance free, paraben free & contains no SLS, Mineral oil or petrolatum. It does have a sweet scent and that’s actually because of the Geranium essential oil that’s added to it. The white colored cream is thick and it’s best to work with small amounts, as a little goes a long way. Due to it’s texture, it’s best for winter only. During summer, it tends to melt right off of the face. But it’s definitely hydrating. Price : $6.28 (Approx AED 23.07) for 120 ml, that should last a good half an year or so!. Super affordable, right?. Currently, this one’s price has been slashed to $5.17 (Approx AED 18.99). Since it’s a small purchase, I opted for the Global Mail shipping option which cost $4 (Approx AED 14.69). It was delivered by post and reached me in UAE in 10 days. I got a loyalty credit of $1.82 for this purchase. When you use my code SCZ695 (at check out), you will receive an instant 5% off your bill total, plus another 5% as loyalty credit, which can be used in your next order! ♡. Happy shopping! Nacomi Skincare & Haircare Haul! Today I would love to introduce you to a brand that I got to know myself just recently. It is Nacomi, a Polish brand that’s crueltyfree, handmade, paraben free, SLS free & allergen free. They use only the highest grade raw materials from around the world to make their products highly effective. ● Moroccan Argan Intensive Hydration Night cream – This one is a thick, luxurious cream that smells absolutely divine. It is, just as it’s name suggests, intensely hydrating thanks to the presence of Hyaluronic Acid in it. Other ingredients that make this cream truly moisturizing are Argan oil (sourced from Morocco), Shea butter (from Africa) & Avocado oil. It melts right into the skin on application. ● No Rinse Argan hair conditioner – As I’ve mentioned before on this blog, I am trying my best to keep my hair looking like it has some life. So, this leave in conditioner attracted my attention. It has Argan oil & Cashmere protein in it to deliver healthy, silky hair. It’s white in color and has a watery texture. It smells like any other hair conditioner – very pleasant and lovely. The smell lingers in the hair, at the same time giving it an instant shine. I like apply it on my hair at night or when it looks extra lifeless before stepping out of my home. It comes in a plastic spray bottle, convenient to spritz on to the hair. It’s long term efforts are yet to be known. Anyways, I got 2 bottles to keep it stocked. ● Hair Mask with Moroccan Argan oil – The ingredients of this thick, white, creamy mask are the same as the ones I just discussed in the leave in conditioner. It is supposed to regenerate and smoothen the hair, strengthening the hair against damage and breakage and restoring shine to dull hair. I usually apply it for 20 mins and wash off. The hair does feel instantly soft and manageable. I am currently using it once a week. It comes in a tube with a flip open lid, conveniently designed to be used while in shower. ● Natural Sugar Scrub – This one is a dense scrub, packed with sugar thats immersed in a base of Argan oil & Shea butter. It also contains strawberry seeds for exfoliation (first time coming across strawberry seeds used for this purpose!). It smells strongly of coffee. I believe it contains ground coffee beans too. I have used it only on my body, since I feel it’s a bit too abrasive for facial skin. ● Cleansing oil – This yellow colored cleansing oil helps in perfect makeup removal while clearing all impurities from the skin. It smells so heavenly and is a mix of several precious oils. Mann, I wanna make this into a perfume and keeps smelling it throughout the day. What a lovely, effective product!. Paris Gallery Summer Surprises Sale – July & August! Paris Gallery, the retailer with the largest selection of perfumes, cosmetics, eyewear, accessories, watches, jewelry and leather goods, has just announced an exciting two-month long summer sale which will run from July 1st to August 31st. Customers can enjoy up to 70% off on selected products across all categories at any Paris Gallery and Watch Gallery store in the UAE. Part Sale bonanza at Lifestyle! Lifestyle, the region’s preferred shopping destination has announced its ‘Part Sale’ that has opened doors to its customers across all standalone stores in the UAE. With a whopping 25%-70% discount, customers can now pick their favorite brands at pocket-friendly prices. Don’t miss out – Hurry now to the nearest Lifestyle store as the offer is valid from the 15th April till 14th May 2015!